Cast-iron skillet roasted potatoes are one of our go-to sides. They go with chicken, fish, duck, and steak, and it’s so easy! What don’t potatoes go with? We prefer using Yukon Gold potatoes because they are very buttery and have more flavor, and they are not as starchy as other baking potatoes. We have three different sizes of cast-iron skillets. 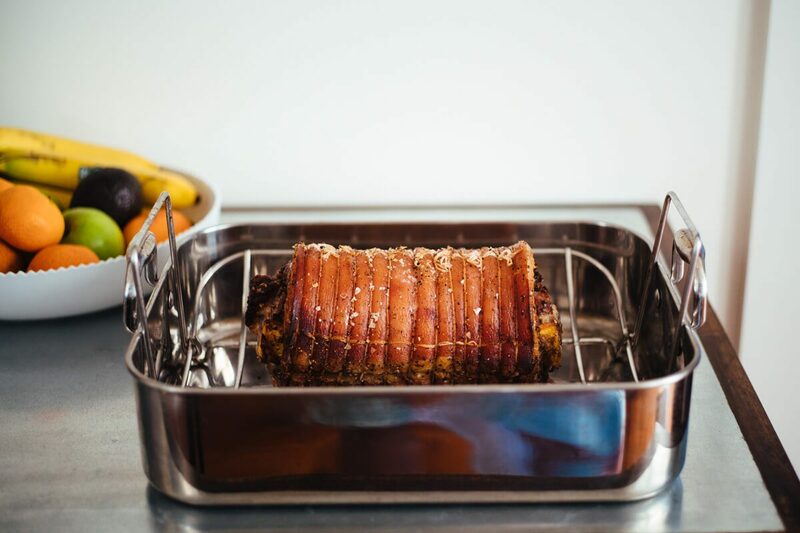 Ours are by Lodge, but we also like options like this, this, and this. The number of people we’re cooking for determines which size skillet we use, but in general we pick the smallest one that will do the job to make cleaning easier. Cast-iron holds heat well and gives the potatoes a very crispy finish. We recommend heating the pan in the oven or on the stovetop before you add the potatoes. Only use fresh cracked pepper! It’s much more flavorful than pre-ground. This is our favorite pepper mill. We use it every day! 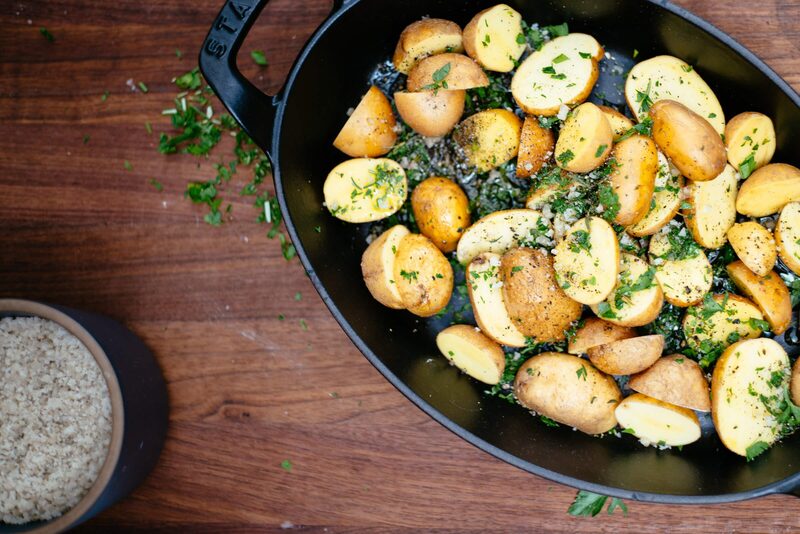 For a variation, we like to make herb roasted potatoes in our favorite cast iron baking dish. If you don’t have one, it’s a must–we use it for everything, including this macaroni and cheese and these bacon-wrapped dates. You can also add cheese to your potatoes , or just keep it simple with salt and pepper. We use Maldon sea salt or French gray sea salt, and finish with fresh cracked pepper. Make roasted potatoes with our perfect roast chicken , our beef tenderloin with blue cheese sauce, porchetta, a pork chop, or fried chicken. 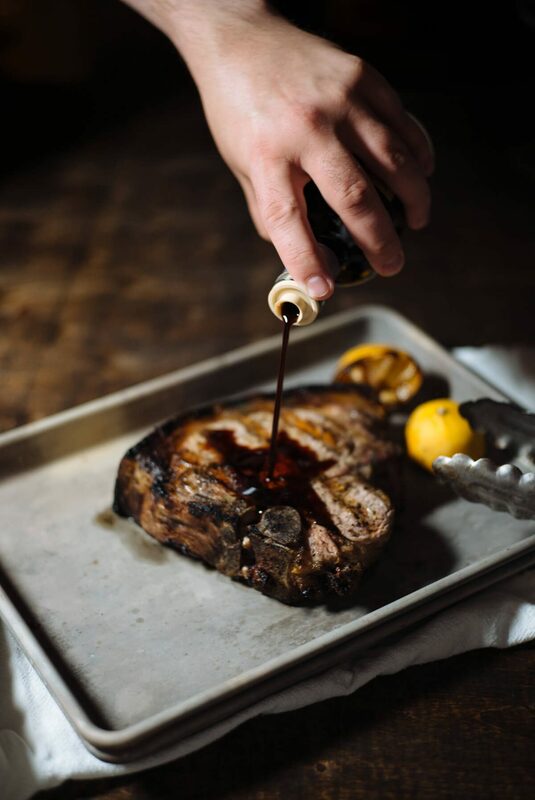 You can also make these on the grill–just set your cast iron pan directly on the grill grate and watch the temperature on the grill lid to make sure it doesn’t get too hot. Wash and pat potatoes dry. This is important so they will coat evenly with oil and crisp. Cut potatoes into desired shape - halved or quartered (depending on size). We used small organic Yukon Gold potatoes so we just cut them in half. Place in cast iron skillet and drizzle with olive oil. Toss until they are coated evenly, adding more oil if necessary. Sprinkle generously with sea salt and fresh cracked black pepper. Toss to distribute. Put the skillet into the oven and roast for 20 - 30 minutes, until very golden. Toss with a spatula a few times during cooking to ensure they are not sticking to the pan. I learn something from you each time I read this! Never knew potatoes should be dry so the will crisp! Thanks! !